Healther Bailey's Peonies in Red- I have about 2.5 yards of it and I have at least two quilts planned from her PopGarden line- which will include heavy doses of this! 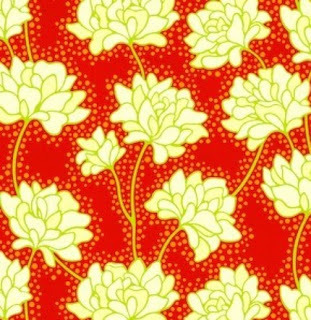 This is one of the first contemporary fabrics I spotted as I slowly discovered the world of bright and beautiful fabrics. I have at least 5 yards of this, as I have a purse and two quilts planned with it. It's Timeless Treasures "I Spy." 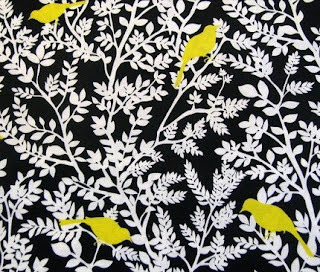 Right now, this is my favorite fabric. It's the first Japanese print I have ever bought and I am definitely impressed- it's an adorbale design, clearly printed, and gorgeous, soft fabric. It's a diaper bag. It was really hard to make mainly because of the stiff divider within the bag... I had to get some help with it. I think I might make a matching portable changing pad to go with it. For Christmas 2008, I received a very cool book- The New Handmade and it had this patern for a mini messenger bag. I am keeping this one for myself! It's perfect for carting around the small essentials- it has a cell phone pocket on the side that you can't see in the picture. I made this bag out of Erin McMorris Park Slope line. It's becoming abundantly clear that I need to take photography lessons..... but anyway, I figured if I post an occasional fabric stash picture, it might make me feel more accountable to actually do something with my supplies rather than keep acquiring more. Soon after Nick left for DC, I consoled myself by heading to the famous Keepsake Quilting in Meredith, NH. The bundle on the right is my attempt to fold fabric like Keepsake does. 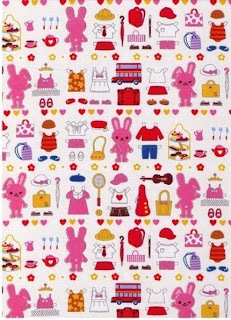 Most of this fabric is from a certain line of fabric, but I can't remember what it's called..... It will make a beautiful quilt- the cherry fabric will probably be reserved for an apron. I had a lot of fun making this purse. It's made from fat quarters and a quarter yard of Amy Butler's Midwest Modern fabric line. It's a present for a friend of mine. This is the quilt I will use for a baby boy someday. I recently added the borders and will soon send it away to be quilted. When it is finished, I will take a better picture and post it. Here's another cross stitch completed, I just need to do the outlining stitches. The background with all of the leaves was a lot harder than I expected because it's reliant on shading. I altered the pattern for the Bend the Rules Cashless wallet to make a business card holder. The fabric is Denise Schmidt Flea Market Fancy. I still need to put a snap on this little guy. Here's the "Charming Handbag" I made for my swap partner (see previous post). It was an easy project. I really lucked out in finding ribbon that matched the lining very well. There was another reason why I didn't post too much in late January and most of February. I had barely found out that I was pregnant and immediately started making the baby stuff! I know I am crazy, but I am pretty determined to not learn the gender of the baby until he or she is born. (Hey, there are only a few really great surprises in life). So I have until late Sept to make all of the boy and girl themed stuff.... Two of the baby quilts I have already posted pictures of are intended for that purpose. Here's some burp cloths and baby bibs I made a while ago. The pint is really bright and busy, so it's hard to tell that I did an applique cherry on each one. It was a fun, easy project. The picture below is a very time comsuming project that I am dreading to repeat for the boy themed nursery...... bumpers! They look like they might be easy, but they are a lot of work! I am happy with how they came out, they will model better when setup in the crib.